The Deal or no Deal online slot machine is based on the popular Channel 4 T.V. show. The slot is available to play at JackpotJoy online casino and games site, either for free play mode or for real cash. Combining the popularity of the TV show with a massive jackpot of up to £500,000, The Deal or no Deal slot is definitely one of the most popular slots around at online casinos. Play Deal or No Deal at Betfair Arcade. 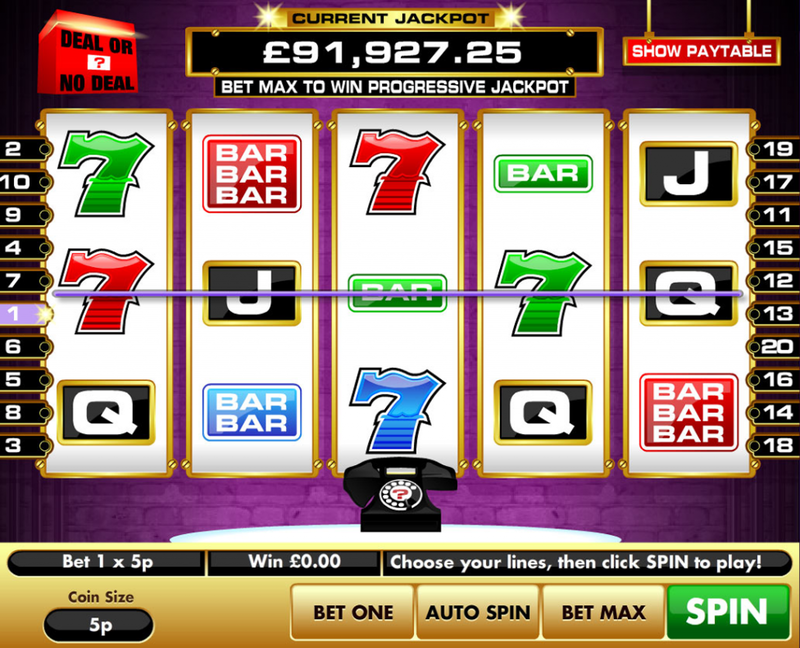 Deal or no deal is a 5 reel slot available to play in either a 5p, 10p or 20p per spin option. Each stake option has a different progressive jackpot, with the max stake progressive jackpot regularly exceeding £500,000. Deal or No deal is not a fruit machine, this slot version does follow the same format as the pub slot version you find in pubs and clubs. Many UK pub slot fans will have seen the Deal or No Deal fruit machine in High Street betting shops and Motorway service stations. The online version of Deal or No Deal is exactly the same as these version with one great benefit – the average payout is configured to 97.2% in the online version compared to 78% if you play offline. Deal or no deal is one of the most popular online slots thanks to it’s exciting 3 bonus rounds, based around the same format as the T.V. series opening various boxes and trying to win as much cash as possible. If you win the progressive jackpot make sure you say “no deal” to the banker! If you enjoy playing slots and fruit machines with bonus rounds, we recommend you check out some of the other popular branded slots such as Cops N Robbers or Monty’s Millions. We recommend playing the Deal or No Deal slot at either Betfair Arcade. or Sky Vegas. Both of these fantastic sites offer a massive choice of fruit machines as well as attractive sign up bonuses for new players.